Mark Jones celebrates his goal for Peterborough Sports against Stamford. Photo: James Richardson. Peterborough Sports upset local rivals Stamford AFC and the formbook in today’s (January 1) Evo Stik League derby. 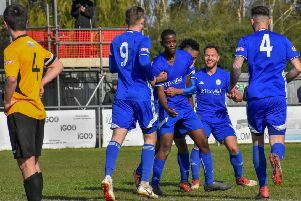 The city side had slipped to the bottom of the Division One South table at the weekend, but they saw off their promotion-chasing visitors 2-0 in front of an excellent Bank Holiday crowd of 336 at PSL. Mark Jones slides in to score Peterborough Sports' second goal against Stamford. Photo: James Richardson. The win moved Sports off the bottom and knocked Stamford down three places to seventh. Only one team is relegated this season. It was a scrappy affair settled by a 24th minute penalty converted by Lewis Hilliard and a 77th-minute strike by Mark Jones. It was Stamford who started on the front foot and within the first five minutes they forced Sports’ keeper Dan George into two fine saves. The first chance fell to Liam Adams within the first 30 seconds, but his shot was straight at the keeper and the second save was far more impressive as George tipped over Jake Duffy’s free kick. The game went a bit scrappy for the next 10-15 minutes as both teams were restricted to half chances as neither side could create any clear cut opportunities. During this period of play Robert Morgan picked up a yellow card for a robust challenge on Sports left back Dave Cobb. Lewis Hilliard (left) is congratulated after scoring from the penalty spot for Peterborough Sports against Stamford. Photo: James Richardson. Sports took the lead from the penalty spot after a cross was fizzed back towards centre back Delroy Gordon whose hand it struck. Hilliard comfortably dispatched the spot kick into the bottom right hand corner. Sports continued to press and almost doubled their lead in what would have been spectacular fashion, but Mark Jones’s audacious lob from just inside the Stamford half went over the bar. Five minutes before half time, Jordan Macleod saw his fizzing effort from just outside the box well saved by Daniel Haystead in the Stamford goal. Ten minutes after the interval Stamford created their best chance of the game. A corner was whipped in by Duffy and after a scramble in the box, the ball fell to Bradley Wells whose scuffed effort rebounded off the post with George rooted to the spot. Sports wrapped up the win 13 minutes from time. Hilliard found himself in space on the right wing and he played a teasing ball into the box which substitute Adrian Mizia flicked onwards to Mark Jones who swept home past the oncoming Haystead. Big centre back Richard Jones was named Sports’ man-of-the-match. The former Stamford captain won everything thrown at the Sports’ penalty area. Spalding’s mini revival ended with a 2-1 defeat at Cleethorpes. Conor Marshall shot the Tulips in front on 20 minutes, but the high-flying home side scored twice in the second half. Division One South: Cleethorpes Town 2 Spalding Utd 1 (Marshall); Peterborough Sports 2 (Hilliard, M. Jones), Stamford 0.